Clearly we’re very excited about the prospect of running this distinctively futuristic small SUV. It manages to tread the fine line between a family car in an en-vogue bodystyle, with interesting styling and an ultra-modern drivetrain promising high fuel economy and low emissions. And to top it all off, it’s also fun to drive. But what’s the Toyota C-HR like to live with? 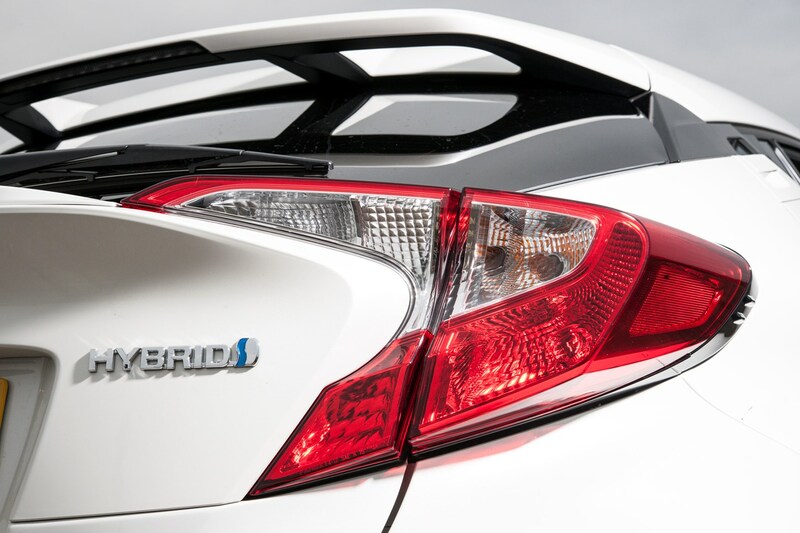 Does a hybrid really work in real life? Are Toyotas still as reliable as ever? Is the C-HR the ideal car for young families? How does it stack up against its closest rivals? What’s the best spec of C-HR? Do you really need all-wheel drive in an SUV? Taking the final point first, the car we’ll be running is in mid-spec Excel specification. 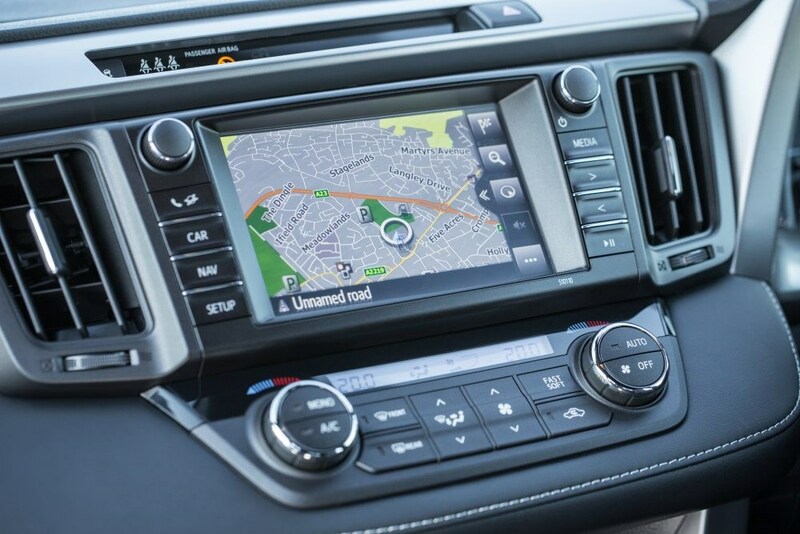 We’re glad of most of the additions on Excel models, but it’ll be interesting to find out whether Toyota’s built-in navigation is as good as a modern smartphone-based system. 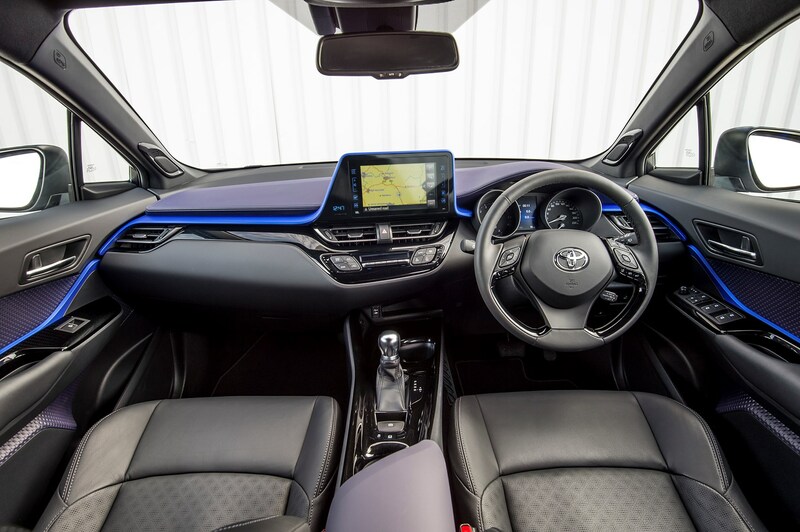 Since Toyota’s trim levels are relatively packed with kit, we’ve only got two extra-cost options: the white paint (£795) and a Leather Pack, which adds cowhide to the seats for an additional £995. 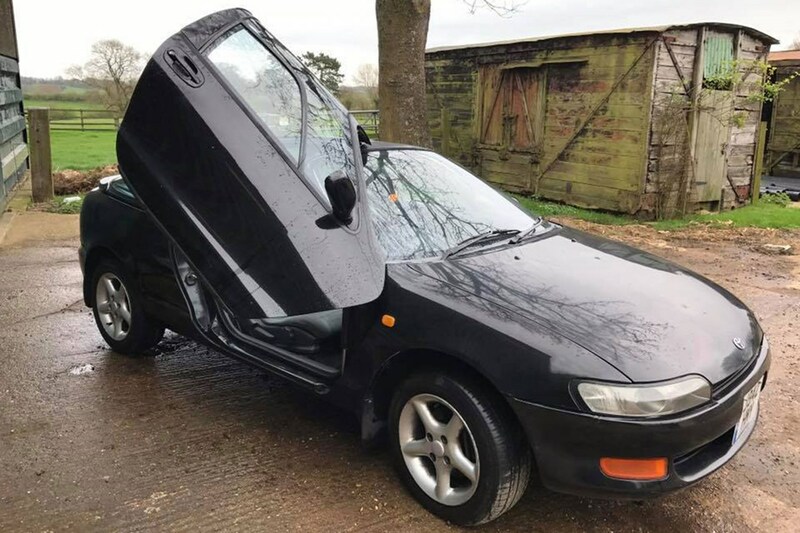 OK, how much does this C-HR cost then? The on-the-road price for our car as you see in these pictures is £28,375 including the extras mentioned above. As for company car users, with its CO2 output at 87g/km, benefit-in-kind tax for this car is payable at 17% in 2017/18. Approximate monthly BIK payments would be around £80 for a 20% tax payer. 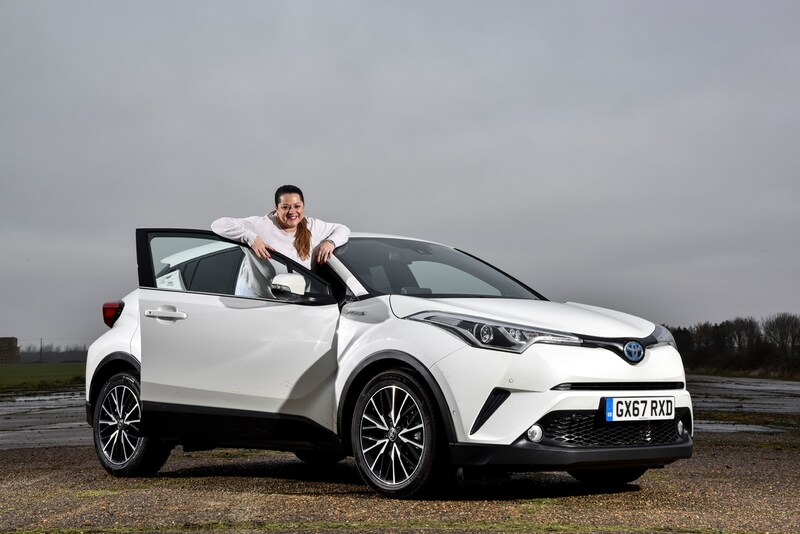 Toyota’s been selling mainstream production hybrid cars since 1995 – longer than any other car company – and our C-HR features the third generation of what’s called Hybrid Synergy Drive (HSD). In this application it’s a 1.8-litre petrol engine with 95hp and 142Nm of torque, which gets assistance from a 53kW electric motor that has the equivalent to another 69hp/163Nm. Electricity is stored in a nickel metal-hydride battery, which can be recharged using the engine or the brake energy regeneration system. 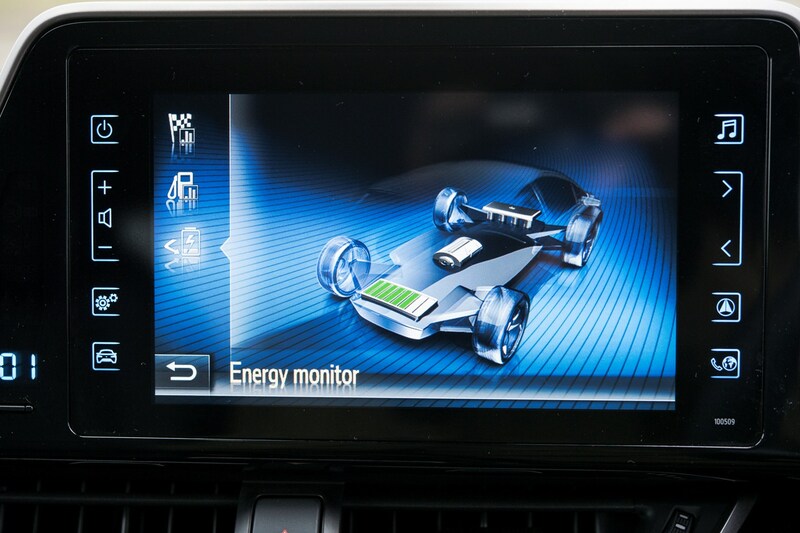 We’re going to be testing this system to see whether we can get close to its claimed 72.4mpg fuel economy – something we’re highly sceptical about – and to find out if there are any hybrid-specific tricks we can employ to make the best of this system. Toyota also sells a C-HR with a 1.2-litre turbo petrol engine without the electrical help, so at some point we’ll be testing one of these too. Will hybrid trump conventional power? 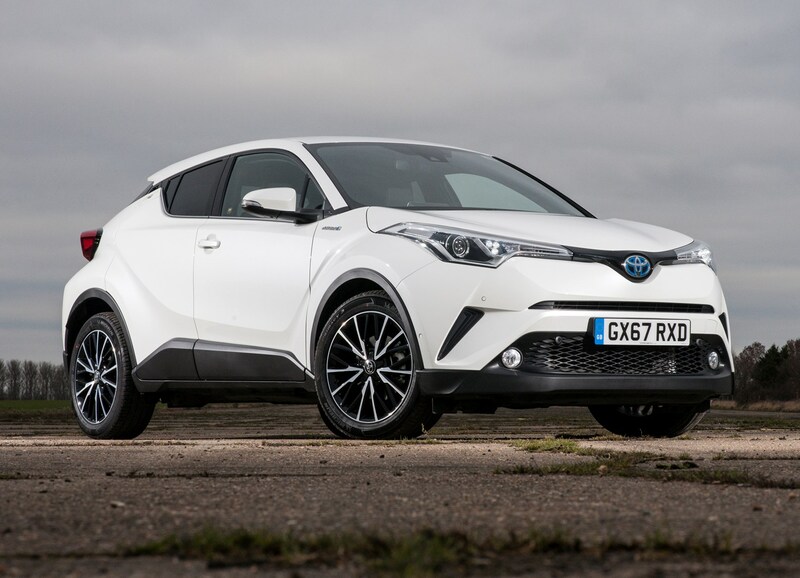 Keep an eye out for future updates as we get to grips with Toyota’s C-HR over the coming months. I’m excited to be driving the Toyota C-HR. 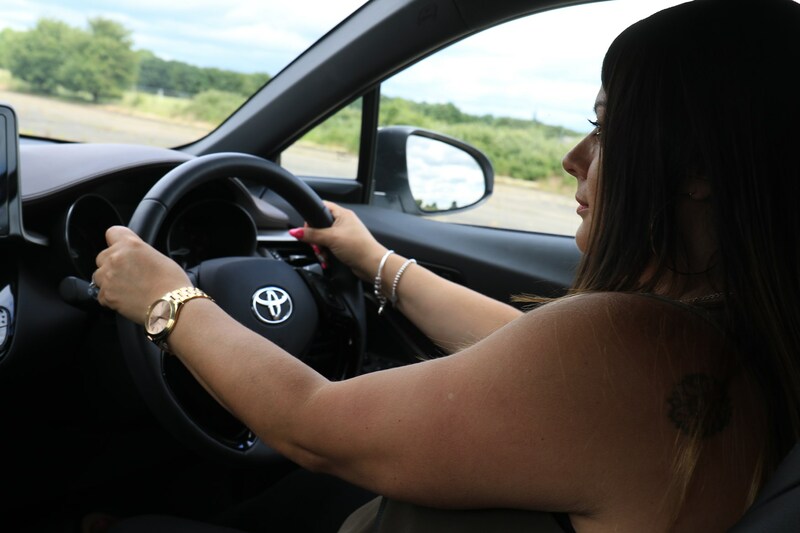 I’m a big SUV fan and being a mum of two boys who like to be ferried around to parties, football training, and any other social event they may have booked, in the Toyota always makes me feel confident with my driving. Being 4ft11 does have some disadvantages with driving, so it’s really important I can see over the steering wheel and even press the clutch right down! However, this car being an automatic is a massive win for me, taking away the clutch issue and making my journeys less stressful when stuck in the usual Peterborough rush hour traffic. I've noticed too that the seat is so easy to adjust to make my driving position comfortable, what with the adjustable steering wheel and the fact the seat can be pumped up nice and high. Initially I liked the look of the Toyota - not normally a brand I would go for - but the car looks trendy with its sculptured body, especially in white. I wasn’t quite sure how I would get on with the rear side windows being smaller, but quite excited to get in this car and give it a go! The boot looks to be a great size and I can get my full weekly shop in there with no problems. I will say the bootlid feels heavy to pull down, but it doesn’t help that I am on tip-toes trying to do that. The whole car is full of lots of generous space, though, and so far it’s looking like a great family car and has everything I need to transport my family around. The heated seats warm up more or less instantly, which is going to be great when I have been standing on the side of the football pitch cheering my boys on in sub-zero temperatures for an hour or so. 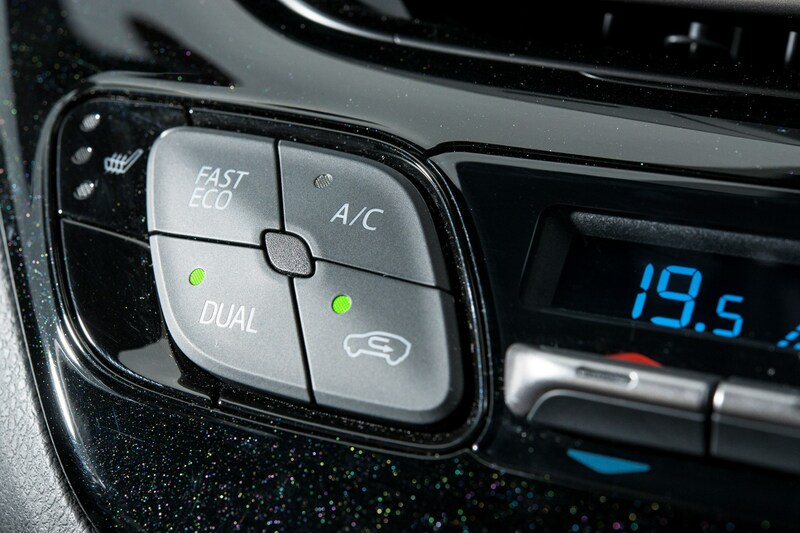 The whole heating system seems great and warms the car up quickly. 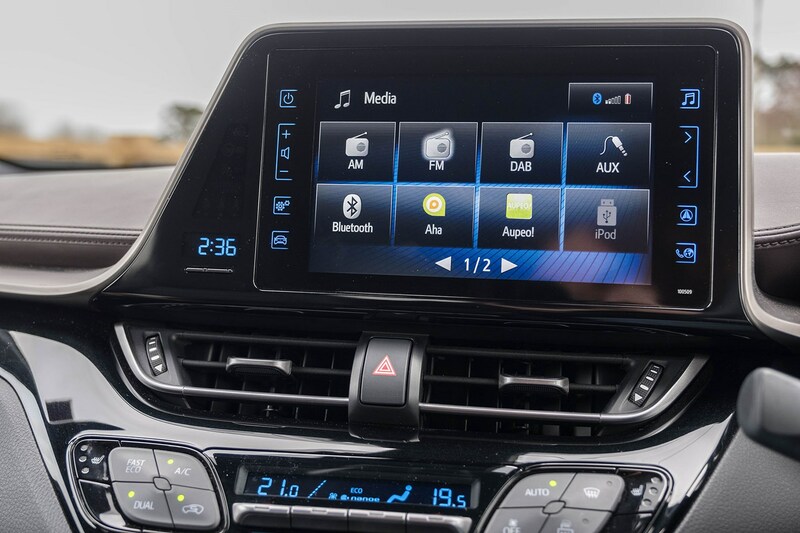 The touchscreen sat-nav is easy to use and quickly connects to my phone, which again makes life easier. I'm looking forward to living with the Parkers Car of the Year for a while so I can understand just what all the fuss is about! 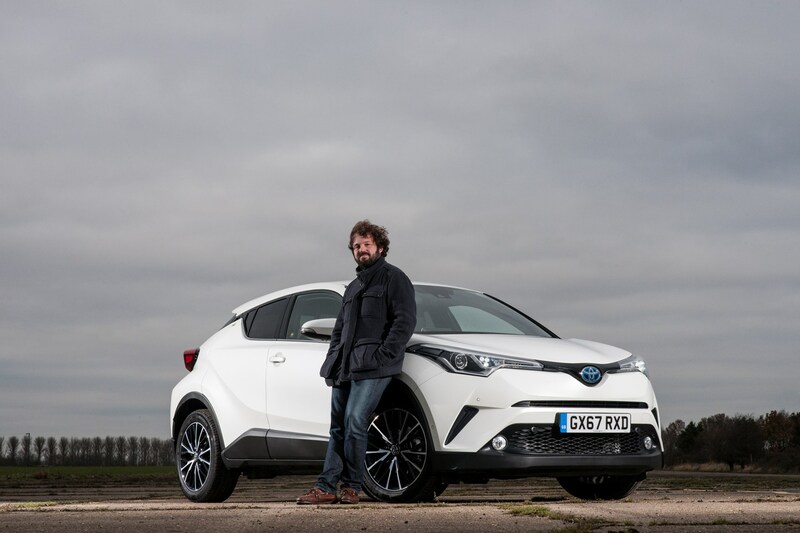 In this update we have first impressions of the Car of The Year-winning Toyota C-HR from two very different writers. 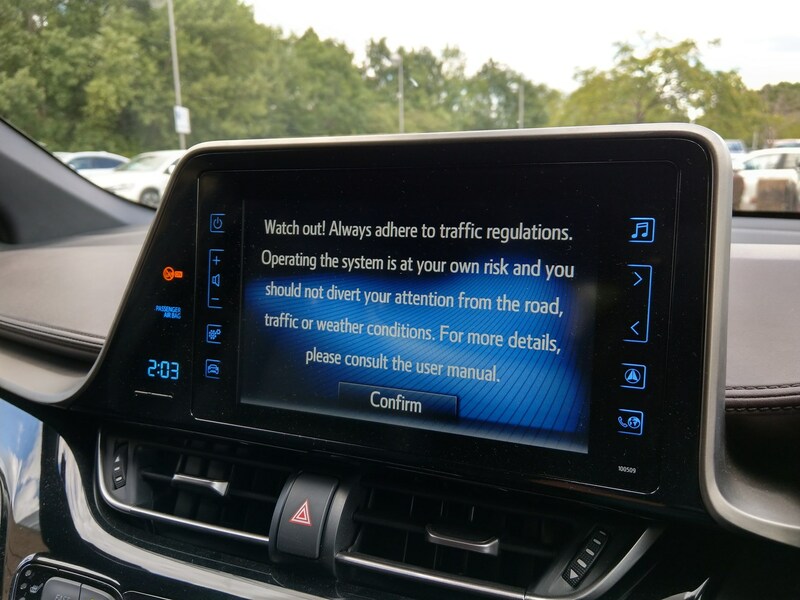 Leise, our Office Manager, offers her thoughts first after using it for family car duties, while Reviews Editor Gareth’s been hacking up and down the nation’s motorways, bouncing from event to event trying his best to understand the HSD hybrid system’s features and foibles. ‘The C-HR offers a comfortable, quiet ride,’ says Leise. ‘Sometimes I have to double check to see if I have even started it as I can’t hear anything from the engine. It feels solid and safe to drive, even allowing me to give a bit of fun in corners! 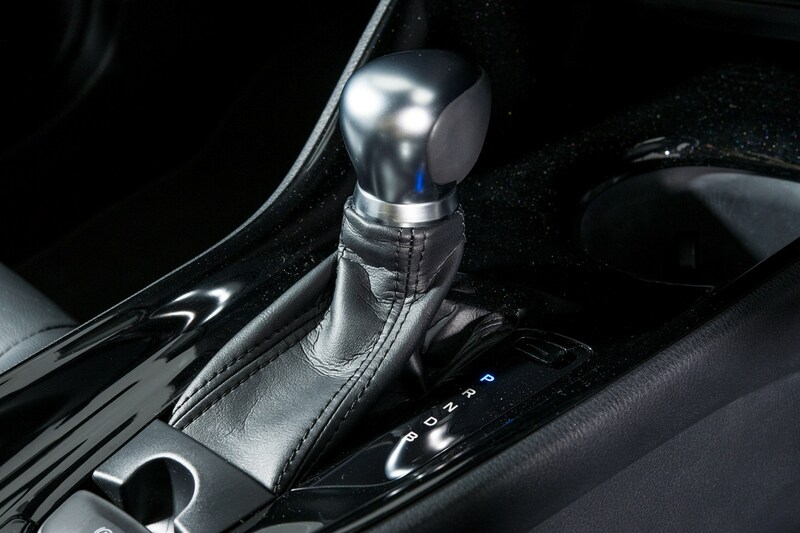 ‘It may be quiet when starting, however the CVT transmission does take some getting used to. Even a small acceleration makes the car go into a noisy rev overload, and the engine will continue to work hard until you reach the speed you want to. ‘This car really suits my family, with its large boot area and generous space inside. I will need to put the boot to test soon and check to see if I can get four suitcases in the car ready for our family holiday. 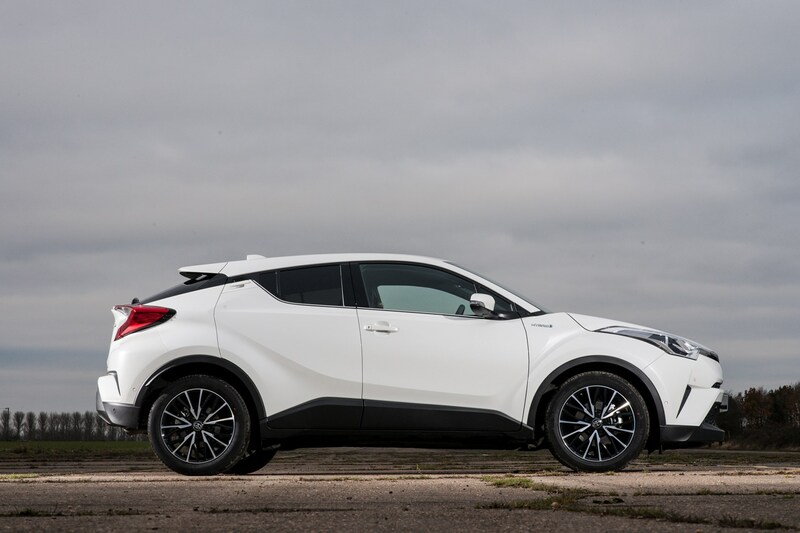 'The spec sheet of our C-HR proudly proclaims fuel economy of 72.4mpg. That’s seriously good for any car, and frankly to start with I was struggling to believe it. It’s been widely recognised in the car industry that the NEDC test that produces these figures is unreliable – it’s captured in laboratory conditions that you simply can’t recreate on the road in most situations, and bears next to no relation to what you can expect day to day. 'That’s why I felt like the C-HR set me a challenge. I’ve found myself trying my level best to eke better mpg – with a 0-62mph time of 11 seconds it’s more interesting than driving quickly – and have actually experienced some pretty decent results. 'On the way home from the VW T-Roc’s introductory event in Buckinghamshire I thought I’d take it as far as I dared without actively angering other motorists, so settled in for a 60mph-max run with fuel economy in mind. 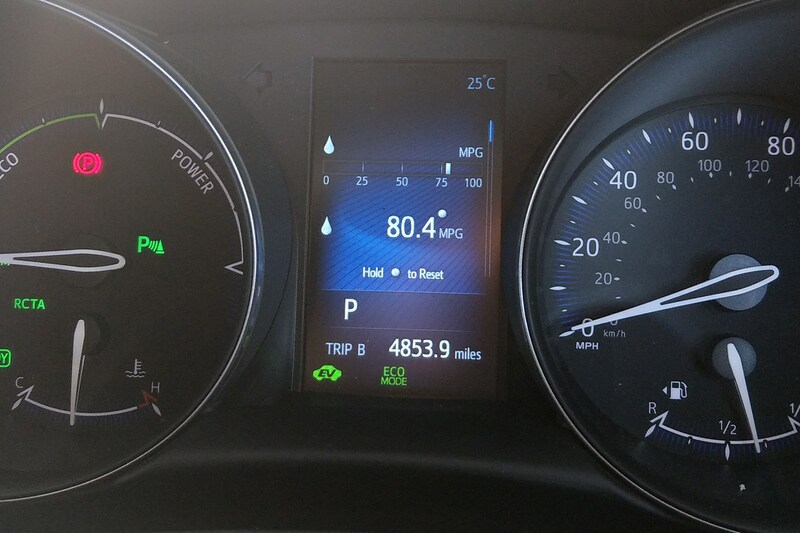 After over 100 miles of driving, concentrating incredibly hard on retaining momentum and using the throttle sparingly, the trip computer claimed 69.2mpg. 'The mathematically astute among you will notice this is very close to that 72mpg figure. Not bad going, though I’m not sure I could keep that pace up for long. Being overtaken by lorries isn’t a situation I’d like to find myself in more than is entirely necessary. 'But with that said, the C-HR is a great car to try this stuff with. 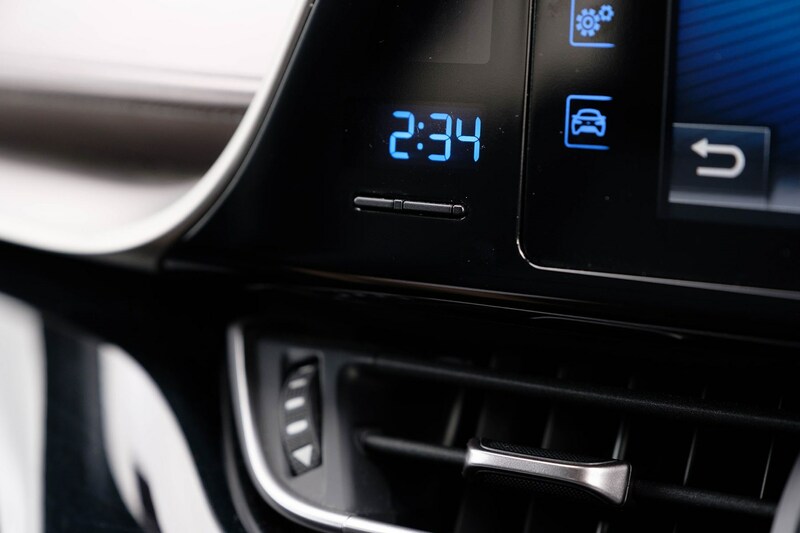 The ride’s comfortable and the multimedia system has everything I need, although I’d prefer it with a little less reliance on the touchscreen, which doesn’t work every time and can prove frustrating for that reason. 'And of course, the average fuel economy over our time with the car so far is far worse, at a calculated 46.1mpg as Leise and I have been swapping in and out, using it for totally different types of journeys. Our C-HR has many rivals. The compact SUV market has swollen beyond all recognition in recent years, and there are over 20 cars that we’d consider viable competition for Toyota’s smallest crossover. 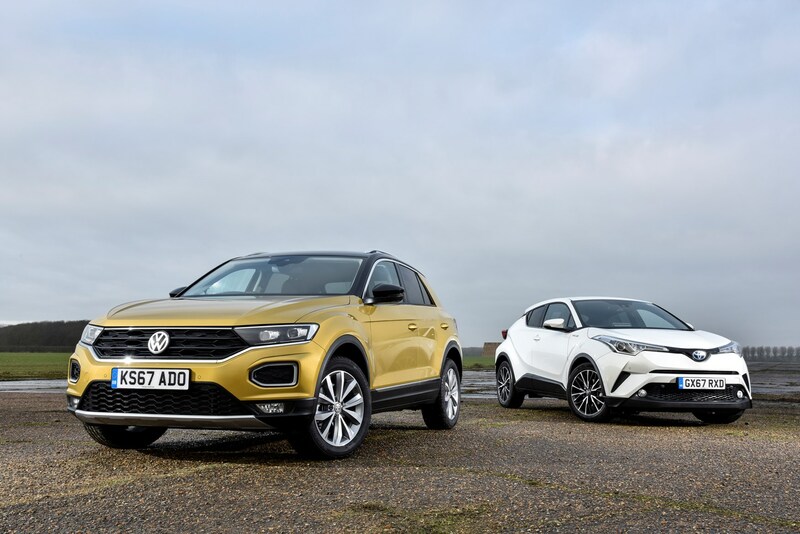 But probably the biggest surprise after Toyota’s was launched back in November 2016 was the VW T-Roc, and in some ways it’s easy to draw parallels with the C-HR. Before driving them, it’s fair to say our team wasn’t exactly enamoured by the idea of either. ‘Just another small SUV’ was the almost unanimous complaint from people lined-up to attend the launch events. Toyota and VW don’t have a reputation for building exciting or different cars, and we hadn't experienced much of a thrill with models like this before, but boy were we wrong. For a start, both of these cars are great fun to drive. They’ve got sharp but light steering and handling that makes you feel properly involved in the experience, which goes a long way towards how much you enjoy driving them. Design is another key point here. 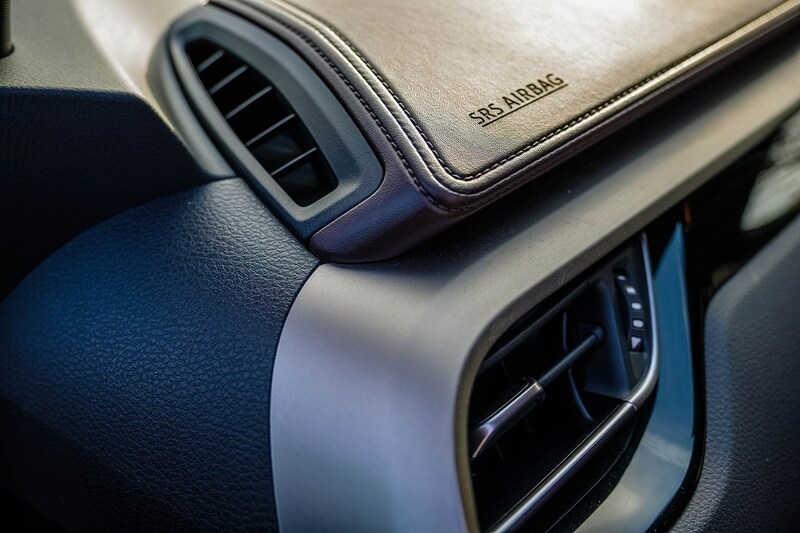 Both cars have cabin layouts that can be personalised with colours to complement the exterior paintjob, adding extra flair to their well-specified trim levels. But there are some key differences. The T-Roc makes do with conventional petrol and diesel powertrains, whereas Toyota offers petrol or a petrol/electric hybrid like our long-term test car. Which is best? That completely depends on your usage. 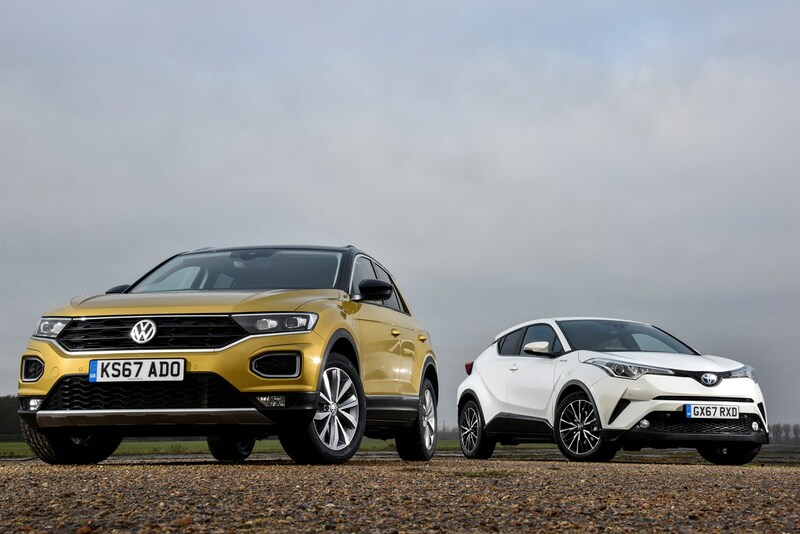 The VW engines appear to offer a good mix of running costs and drivability, while C-HR’s are better still financially but perhaps not quite as enjoyable an experience. Practicality is a little more clean-cut. Both cars have around the same cabin space, but the T-Roc’s boot measures 445 litres to the Toyota’s 377. That’s quite a difference. 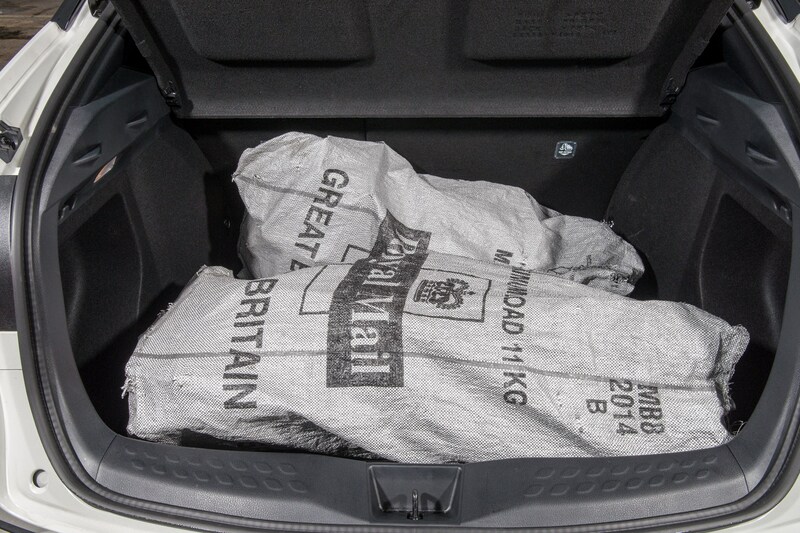 Neither has an appreciably low loading lip either, but the VW’s rear seats fold flat for loading bigger items; unlike the C-HR’s that do fold, but sit at an angle against the front seats. The thing about both of these cars is that they’re emotionally compelling vehicles that we couldn’t recommend with our sensible heads on. You can find far better value by picking a low-cost hatchback, for instance, but let’s be honest here: people don’t want to drive dull cars. They’re looking for something a little more individual, preferably with some chunky off-roader chic and cheerful styling that isn’t going to offend the neighbours. Oh, and that all-important fun-factor ensures an easy job for a salesperson converting a test drive into a sale. It’s easy to see why these cars are so popular. Which one’s best? That’s a matter of personal preference really. The T-Roc is slightly more practical but the C-HR can prove loads cheaper to run. Our money would probably go on the Toyota for that reason. Neither is going to disappoint, though. A bit of digging into our accurate pricing data has thrown up what is an undeniable hidden talent of the Toyota C-HR. It makes a fabulous cash purchase. That’s because the C-HR’s predicted resale value is very high. How high? Well, our database says that after three years and 30,000 miles, which is the industry standard leveller for talking about residual values (RVs), our long-term test car will maintain a whopping 58% of its £28,375 as-new cost. Better still, a lower-spec Icon version of the same car without leather or sat-nav will keep a huge 61% of its value. That puts it at the top of the class. Depreciation at those levels is quite unusual in this sector of the market. 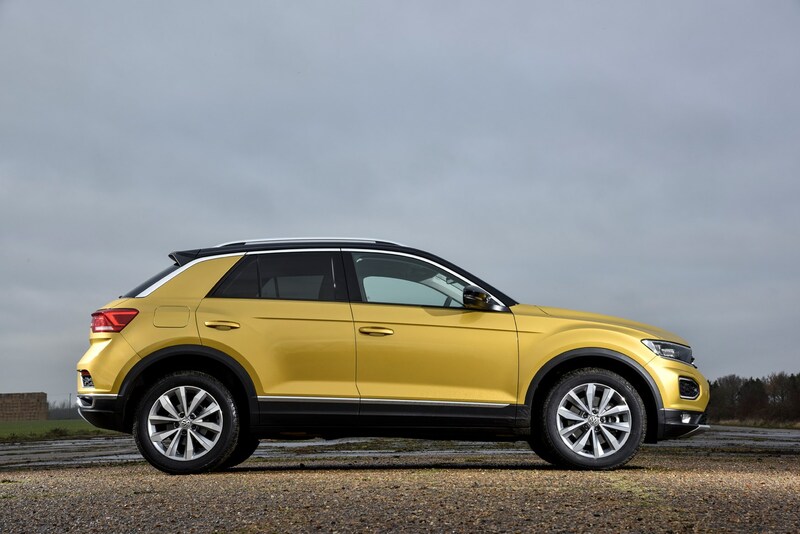 In fact, the only other small SUV that does anywhere near as well is the VW T-Roc 1.0 Design – the most desirable version of another car that’s proving seriously popular with UK car buyers right now. This retains 60%. You have to jump to the larger and comparatively more expensive Volvo XC40 or Jaguar E-Pace to get closer to our lowly C-HR. Put against cars like that, it’s clear to see the humble Toyota and VW are shooting way above their pay grade. Of course, the upshot is neither will make great used buys because they'll be worth so much more than other cars launched at the same time. It’s a clear indication of the appeal of the best compact SUVs for new car buyers, though. Now, we’re not saying that the C-HR does so well as a direct result of Parkers awarding it our Car of the Year award for 2017. Working at Parkers is proving to be an education. A positive one, for the most part – as I’m discovering that far from the overweight, dynamically challenged machines it felt like cars were becoming in the mid-2000s, drivers in 2018 face a choice of incredible machinery. In fairness, I passed my driving test in 1992, so that’s where my frame of reference for ‘new cars’ was formed. Coincidentally, 1992 is when the most futuristic Toyota I’ve ever owned was built – a Phase III Sera, which never made it to the UK officially. 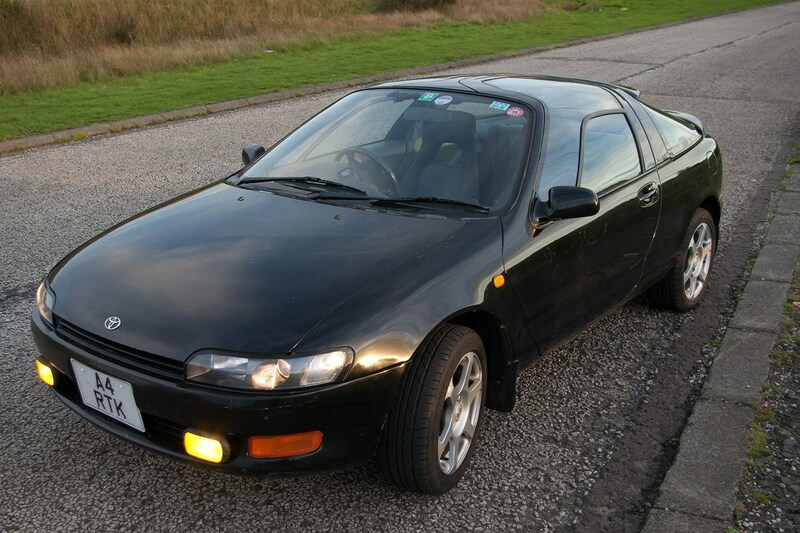 Nothing from the firm has really grabbed me since, and the end of Celica and MR-2 production meant there really was no reason to visit the showrooms again, despite the incredible service the dealers provided and impressive quality of the cars. The C-HR was the first car I encountered at Parkers, and it grabbed my attention. That one was the Car of the Year model, with striking holographic and blue interior highlights, but the basic shape is the same for all of them. 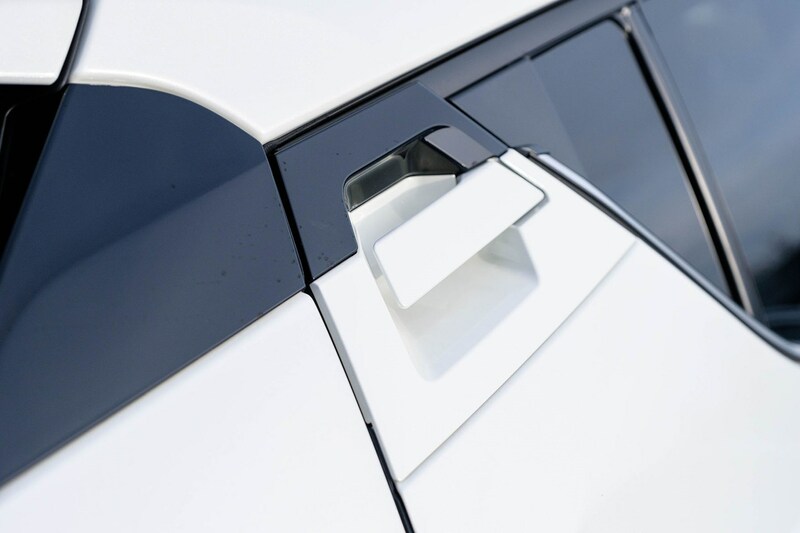 Delightful details abound - the hidden door handle, prominent rear wing and bold lights directing the eye across a tall coupe wedge that uses complex surfacing extremely well. It’s a fairly bulky, high-sided car yet it succeeds at presenting a very dynamic visual even when parked. Getting an opportunity to drive it, therefore, was very welcome. Could this be the next land-bound spaceship? Gleaming white paintwork and an almost floating sill certainly implies it. No butterfly doors, though, and a quick glance at the rear seats suggests oubliette rather than stargazing. Our Excel example is also less wildly trimmed, though the 3D-textured door panels and (rather unconvincingly) fake stitched leather dashboard are still a step above the usual grey plastics. There’s some of the holographic plastic too, and the oddly rubber-coated metallic strip looks very good without the anodised finish. If this is what the exterior and trim looks like, how is this thing going to drive? Surely there’s an arcade-game experience waiting. And there’s no CarPlay. Back to Bluetooth pairing, and at least Siri eyes-free sort of works in that stilted way that happens when it’s trying to work with hands-free systems. The digital clock. In blue. Like a 1980s Sony cube radio. And the heater controls with little LCD symbols reminiscent of a Nintendo Game & Watch. This is the future, but it’s the future I grew up thinking might happen, not the future actually possible with modern technology. It feels dated, like watching Star Trek set centuries in the future and wondering why they foresaw natural speech controls for the computer, but assumed we’d still have heavy glass CRT monitors. (For readers born this century, TVs and monitors weren’t always flat. They used to be cubes, with a giant, power hungry device that fired electrons at a thick glass screen to make it light up. We basically had tiny particle accelerators to watch our four channels of TV). It’s okay. The instruments, controls and in-car entertainment feel dated, but that’s not what this car is about. One point for the C-HR – that CVT/hybrid powertrain has been sensibly paired with adaptive cruise control that works from standstill. That’s a point above the soothing luxury charms of a Lexus IS300h we had in at the same time, which stopped working below urban commuting speeds. Lane-keeping is less proactive, so it’s not a traffic jam-soothing autonomous mode – rather, it’s just very, very good at getting rid of the drudgery without taking away the driving. This is the future for the real world, and it’s effective. Plus, there’s that additional element of massively reduced emissions; EV mode copes brilliantly with commuter stagnation. Once out onto the dual carriageways and A-roads, the C-HR’s drivetrain provides something of a culture shock. A slightly coarse, constant engine note, and no real feeling of acceleration masks a surprising turn of speed. Not rapid – not electrifying away from the lights – more a snowball effect of momentum and a remarkably competent chassis. Yes. It’s carrying a fair amount of weight with the battery packs, and yet handles rapid bends with a nimble precision without needing suspension so stiff that the car is unsettled. You have to watch the speedometer – the lack of engine noise variation (or noise at all, sometimes), lack of involvement with gears, surprising lack of tyre roar and wind noise. It’s not quite serene (and really the car needs a white interior and more natural light to pull off that 2001/Clockwork Orange futurism), more securely detached. Some cars feel like you’re wrestling with physics, Some cars feel detached and slightly unnerving in their delayed, muted responses. The C-HR IS detached, all drive-by-wire and synthetic response, but feels authentic and immediate all the same. Daft question, because the GT86 exists. 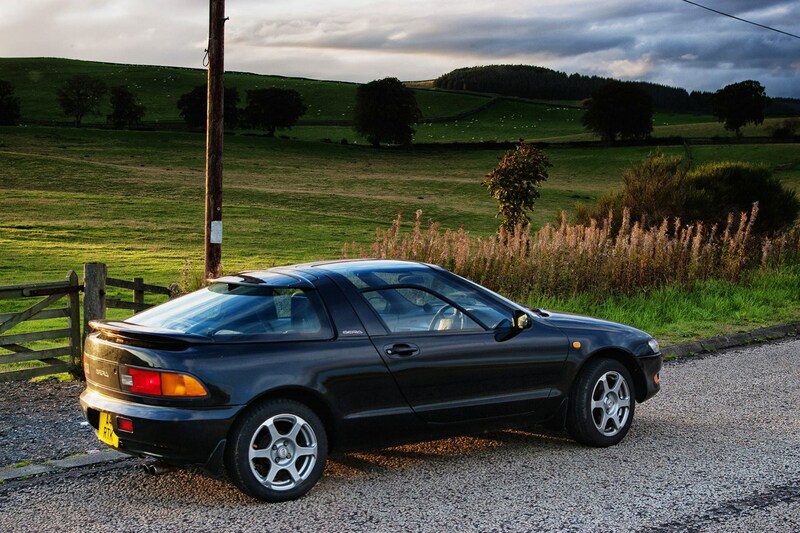 I get it though, the MR-2 has gone, the Celica has gone, and at least until recently, so had the Supra. Quirky and youth-oriented the C-HR is, but it’s not fun in the traditional sense of driving. Image and technology, though, are full of geek appeal and the car looks great on the road. Because 21st century driving, more than ever, is not about wishbones and dampers, brakes and differentials. All that stuff is nailed down, perfected, high-specification yet affordable. What lies beneath modern cars is the stuff of 1980s supercars, frankly. So that purchase is all about taste, lifestyle, image. What appeals to you on a sensual, visual and external level, what projects the right messages about you to your fellow humans. For the majority of younger drivers looking for something reliable, eco-friendly and easy to drive the C-HR sends out and delivers all the right messages without compromising, and it’s impressive for it. Cars like the Sera may not return – but the balance has changed. That car sent out all the right messages for people who wanted to live in a Blade Runner landscape, but was excruciatingly dull to drive. 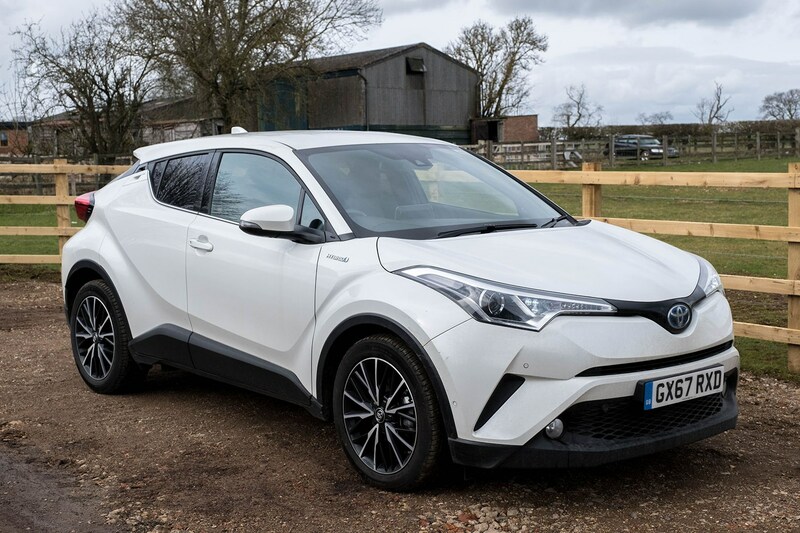 It was crying out for the technology underneath the C-HR, and once you shed the attachment to the old ways, the new Toyota really does feel futuristic. ‘It’s impossible to get over 45mpg whatever you do’. Those are just some of the statements various colleagues have uttered after a short spell in our C-HR long-term test car. And to these people I say: piffle! You see, during my time with the car – and I’ve driven it far more than most – there have been hints of brilliance from the hybrid powertrain. During one particularly traffic-sullied trip back from a launch event near Silverstone last December, the trip computer stated I’d managed over 60mpg without much in the way of trying. So once I’d heard so many of my fellow journalists bemoaning this Toyota’s alleged inability to return decent economy, naturally a challenge was afoot. I decided to see exactly what was possible. 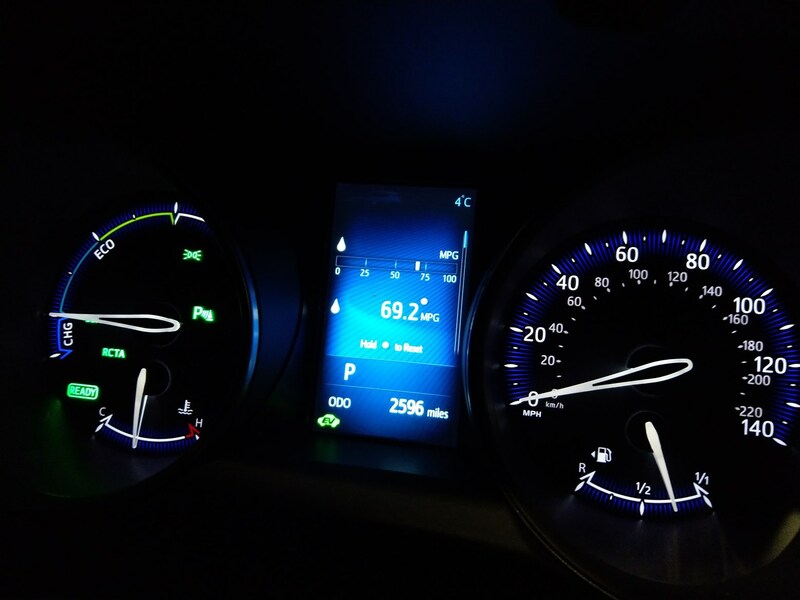 It was time to do some hypermiling – the process of eking out maximum fuel economy from a car using every method available. To do this, first the car needed setting up. But actually there wasn’t a huge amount to do on the C-HR. I checked tyre pressures were at the upper limit of where they should be according to the manual – more inflation means less rolling resistance; to a point. I brimmed the tank with super unleaded petrol, too. This is a bit more expensive but should offer better fuel economy because it’ll allow the car to run more efficiently. I didn’t have anything in the car I didn’t need, either, because extra weight is a big factor in fuel economy. It should work out to just over 200 miles. A decent test. The reason I chose this route was because it offers a good spread of types of driving. It might look like it’s mainly motorway, but actually there are long stretches of low-speed roadworks and A-roads as well as higher-speed cruising. Slotting the gearlever into D for Drive, I silently wafted out of the petrol station on electric power. A great start – I didn’t have to use any fuel at all to begin with! Of course, the C-HR’s range on electricity alone is miniscule compared with plug-in hybrid cars like the VW Golf GTE, so the 1.8-litre petrol engine fired up just before I hit the southbound A1. I’d decided on just one rule for this drive: not to annoy other road users. That means not driving too slowly, so I figured I’d set my speed at around the same as trucks travel at – between 50 and 60mph depending on the conditions. So with the lightest-possible touch on the throttle I coaxed the C-HR up to speed gently, using the downhill sliproad to my advantage so the engine didn’t have much work to do. Then it was time to settle in for the journey. The A1 passed quickly, and I subsequently found myself on what has to be one of the worst stretches of road in the UK right now – the A14 towards Cambridge. 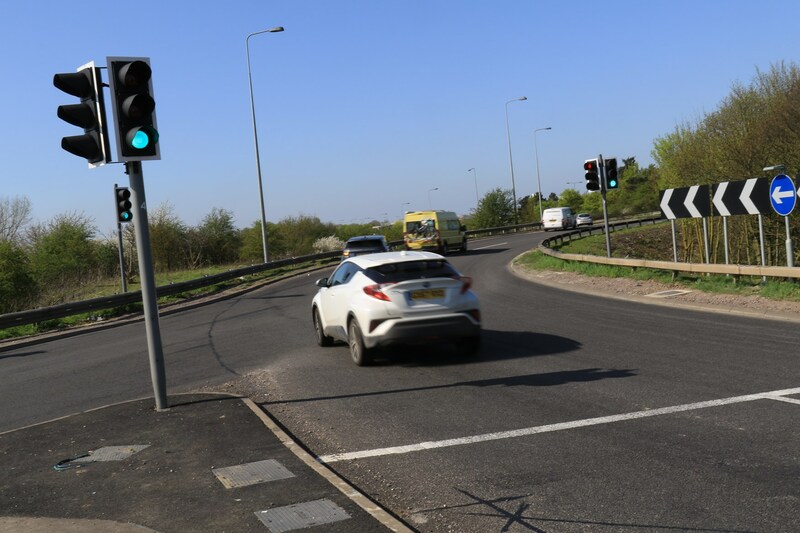 Quite apart from the hellish several-mile-long daisy chain of Specs average speed cameras enforcing a strict 70mph limit, there’s a major roadwork project underway here to widen this main arterial route to the UK’s eastern cargo sea ports. At one point the limit drops from 70mph to 50mph, and then to 40mph, which naturally causes a bottleneck and actual road speeds to fall to zero. This might sound like bad news, but actually the C-HR’s hybrid system seems to work very well indeed in traffic. Its electric power is enough to get the car crawling forward, then use of the brakes recharges it effectively enough to repeat the cycle. I was surprised just how little I was on petrol power. But it was at this point I also noticed a flaw in my plan. The day I’d picked – April 18 – was the hottest day of the year so far. The fans in the C-HR alone simply weren’t going to cut it, blowing hot air around the cabin rather than actively cooling anything down. The temperature gauge read 24 degrees C at this point, and the day’s heat still had some way to go. How long could I hold out before pushing the button labelled AC? After 20 minutes or so sitting in a jam, the cabin was stifling and I was shifting uncomfortably in the leather driver’s seat. The drink I’d started the trip with was long drained and the sun was hammering down with relentless fervour. I was thrilled to get moving again, just for the airflow from the vents, and once past Cambridge I was back up to my 60mph maximum and cruising well. I slotted in behind a lorry – close enough to get into the area of disrupted air but not too close as to be dangerous. This is a critical balance when hypermiling, because you need to be able to see what’s happening in front so can’t very well stick right on the trailer ahead’s rear bumper. Luckily racing experience paid dividends here, giving a little extra appreciation of how airflow works behind moving vehicles. I quickly found the sweet spot. As I passed Duxford I was buzzed by a historic biplane flying back into the Imperial War Museum and it was at that point I could take it no longer. I had to cool the cabin down. I pushed the air-con button, engaging it in its least battery-draining Eco mode. Within a minute there was a massive difference in temperature, my environment improving dramatically as the degrees fell away. After around 2.5 minutes the AC had had enough of an effect and I promptly switched it off again. This signified a change in my plan. I’d need to use the air-con if I wanted to finish the day alive and approximately the same bodyweight I started with. So I’d use it sparingly, in short bursts, when I really had to. You may be wondering why I’m so vehemently against its use, but the simple fact is air-con is a big drain on engine efficiency, and directly harms fuel economy. Depending on speed it can have more of an effect than opening the windows – something else I was keen to avoid, since it harms a car’s aerodynamic efficiency. The rest of the run down to the M25 was increasingly busy, and passing Stansted airport driving standards fell of the proverbial cliff. I’m not sure quite why this phenomenon exists, but it seems whenever you get within a handful of miles from the 117-mile-long ringroad around London people forget everything they’ve learnt about piloting their vehicles. Lorries were swerving between the slower lanes, and my chosen velocity meant the diminutive C-HR was in the mix too. Dicey. I held my ground, though, and steeled myself for a few more hours of the same. Another driving technique I employed throughout the drive is best explained using the Queen Elizabeth Bridge at the Dartford Crossing. This involves a long, slow (50mph limit) climb to the middle of the bridge and then a decent afterwards, so what I did was build up as much speed as I could before the climb, then used as little throttle as I could to stay within 10mph of the speed limit. Once I’d crested the hill, I’d coast down the other side, using no fuel and regenerating battery power at the same time. I have to admit, this is the first time I felt glad the powers that be got rid of the toll payment booths at the crossing in favour of an online system. It meant I didn’t have to slow to a stop before accelerating back to motorway speeds - the enemy of good mpg. Instead I just coasted right through. But by this point another weakness reared its head. Me. The Toyota’s fuel level indicator had only just moved off showing full, but I needed a fill-up myself. Clackets Lane Services was the next available opportunity, so I coasted from the motorway right onto the forecourt and grabbed a sausage roll and some cold and very much-appreciated water. Then it was time to head all the way back up to Peterborough. It was around this point I saw the day’s highest temperature: 27 degrees C. I was still using the air-con sparingly, and started to notice the effect it actually has on engine performance. 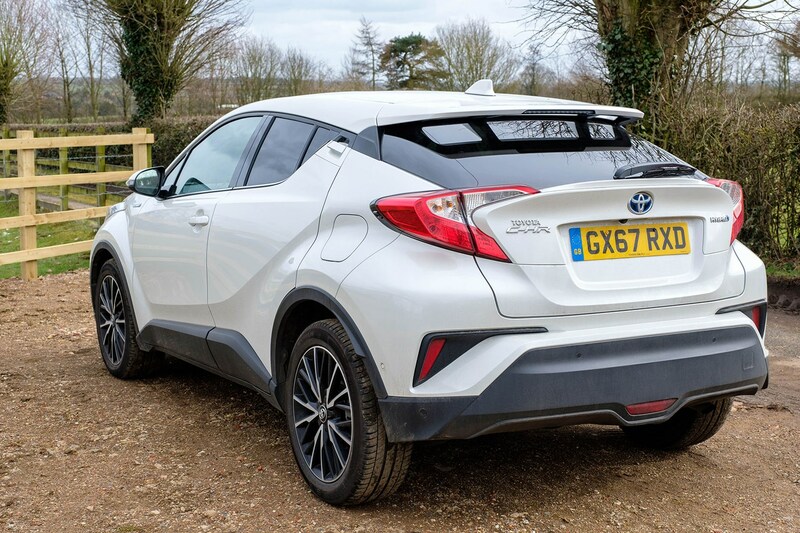 The C-HR simply doesn’t coast as efficiently – almost like there’s extra resistance. You don’t notice a change in output as such. It’s just more difficult to maintain speed without pushing the throttle harder. Passing Europe’s busiest junction where the M4 meets the M25 at an average speed well below 10mph, we soon sped up, and then fate intervened to make a decision for me. I’d not decided which route to take to get back to Peterborough. 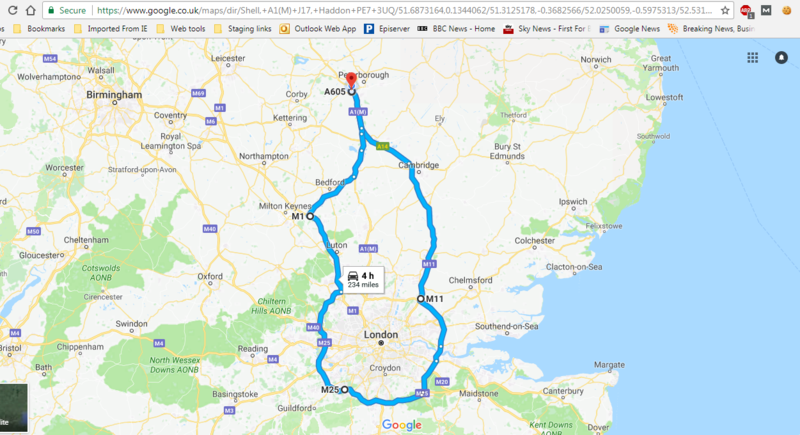 In my experience from here it’s usually pot luck as to which of three routes is the quickest way back there – the M1/A421/A1, the North Orbital joining the A1 at Hatfield or simply directly up the A1. However, the gantry signs stated ‘A1 closed J6-7’. This made life a lot easier, because to avoid that closure and the surrounding traffic, the M1 route was my only realistic option. 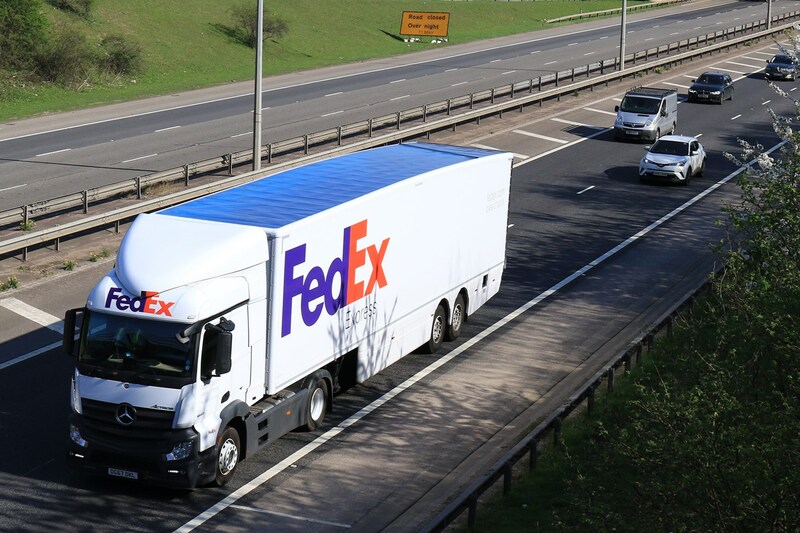 I was thrilled to be leaving the M25, and as an added bonus the sliproad system allowed me to maintain speed, whereas the other two junctions had roundabouts that required stopping. I’d been clever and hadn’t even realised it. Onwards and upwards, then, climbing the M1 though Luton and on towards a set of roundabouts I couldn’t do anything to avoid. These were at Milton Keynes (of course…), where I took the A421 - an A-road dual carriageway. I had to stop once at traffic lights, but fortune favoured my planet-saving eco run and I managed to whip through the other two sets on green. Ish. Accelerating back to the magic 50mph-or-so, this section went without incident right up to the Black Cat roundabout, where I turned left and headed north on the A1. The home straight. At this point the car was indicating numbers I very much liked the look of. It was everything I could do to stay sensible after over five hours in our small SUV, but I managed to fire the C-HR over the roundabout at Buckden by braking early, spotting a gap and losing as little momentum as I could. 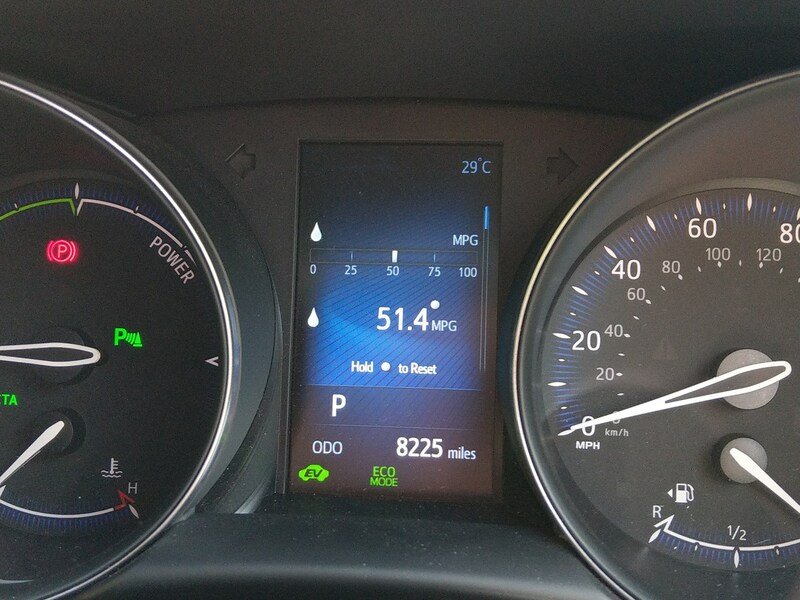 Keeping up your mph is absolutely vital – and this is evident in the fuel economy on the trip computer dropping considerably as I accelerate back to the 40mph limit for the roadworks on the A1. Now, you may be wondering why the trip computer read slightly over. It isn’t unusual for cars to misread slightly, and in this case it looks like there’s 4.2mpg difference, so not exactly the end of the world. The discrepancy could have been caused by all manner of unaccountable factors, even down to atmospheric pressure or the amount of fuel in the filler neck before the pump ‘clicks’. However, it’s still above Toyota’s own claimed combined fuel economy. Only the firm’s quoted Urban figure of 80.7mpg is higher, and we actually did very little driving at those sorts of speeds. The cost per mile calculation isn’t as impressive taken in context with other cars, either, but then this would drop considerably using normal fuel. With that in mind, admittedly this wasn’t the most scientific exercise ever carried out, but the results are still undeniably impressive. This article: 710 words per gallon. 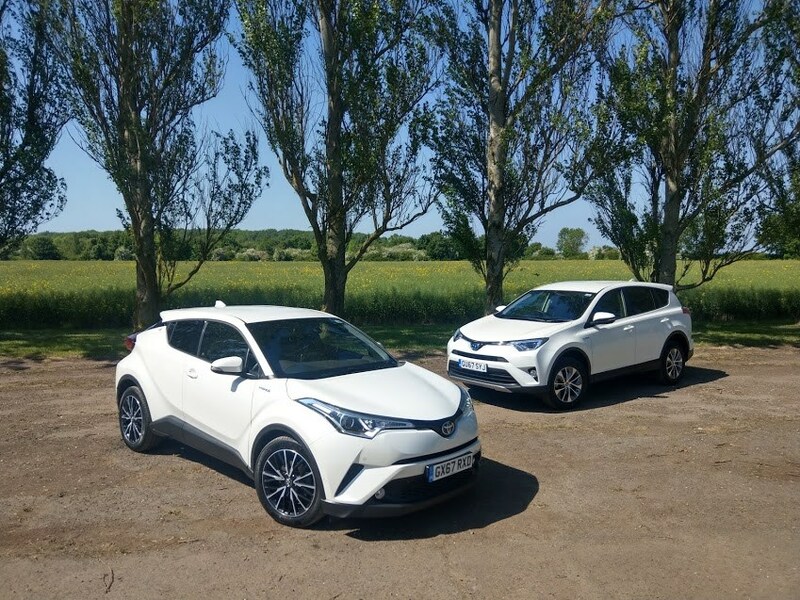 While they’re both white Toyota SUVs, there are some interesting differences between the RAV4 and our C-HR - despite the fact they’re both hybrids that cost almost the same. 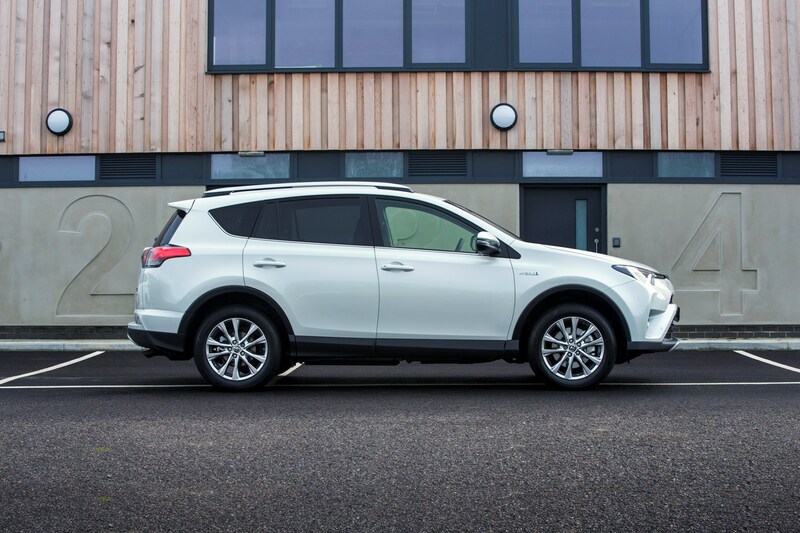 The RAV4 is £30,495 while our car is £28,375 as tested, so £2,120 separates the two Toyotas. We tested them back-to-back to see what the differences are, and which one you should buy. Immediately obvious from the beginning, the C-HR’s a lot less powerful than Toyota’s larger RAV4 hybrid, which has a 2.5-litre petrol engine and a 650-volt motor for a total system output of 198hp and 206Nm of torque. That means 0-62mph in 8.4 seconds and a 112mph top speed. The smaller C-HR gets 100hp and 142Nm for a 0-62mph sprint in 11 seconds and a 105mph top speed, but also boasts far greater efficiency. Its claimed fuel economy of 72.4mpg is something we’ve already beaten, whereas the RAV4’s 57.6mpg figure was a lot harder to get close to on the road. This older version of Toyota’s HSD hybrid system doesn’t seem to remain on electricity for anywhere near as long as the C-HR does in any given situation. The savings at the fuel pumps is matched by tax advantages for the C-HR too, with CO2 emissions of 87g/km meaning much cheaper VED car tax (£105 plays £165 a year at time of writing) and BIK company car tax than the 115g/km RAV4 can hope to achieve. In our case, a 20% tax payer will be in for around £90 per month for the C-HR versus £122 per month for the RAV4. Choosing the latter could cost you £384 a year in tax alone. There’s a big difference here too. Our C-HR is much nicer to drive than the RAV4. This is for two reasons: it’s based on Toyota’s TNGA platform (just like the Prius) and this has been widely complimented for an enjoyable steer. Furthermore, it uses a newer and far more refined version of the HSD hybrid system that works a lot more effectively than earlier ones. Technology has come on in huge leaps in this area, and driving these two back-to-back illustrated the difference perfectly. Where the C-HR is smooth and quiet, the RAV4’s battery-fed electrical assistance runs out noticeably faster, which means you use the petrol engine more. There's an irritating moan from it as the transmission holds engine speeds high in order to make progress. This is a common theme with CVT-type systems found in both cars, though again in the C-HR it’s quieter and happens less often. How about to live with? The RAV4 fights back with a far more practical design. 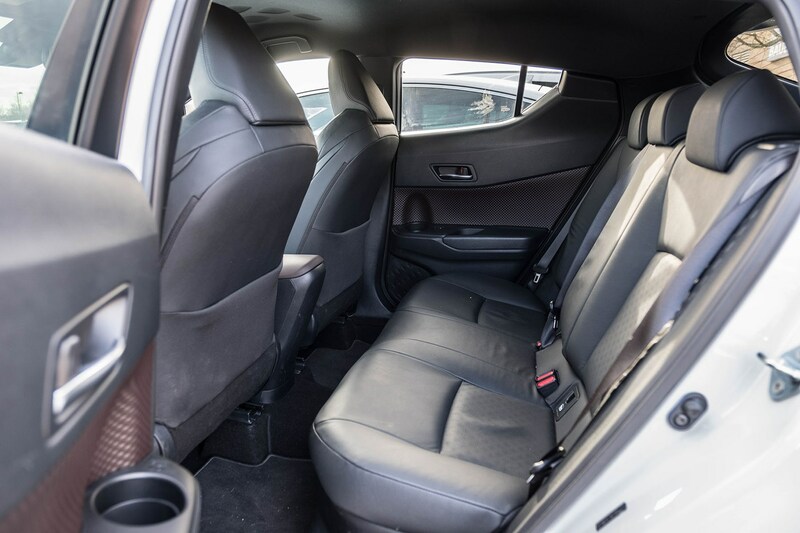 Not only is there more space in the back, but it’s noticeably brighter back there too which is going to come in useful if you’re transporting kids regularly. 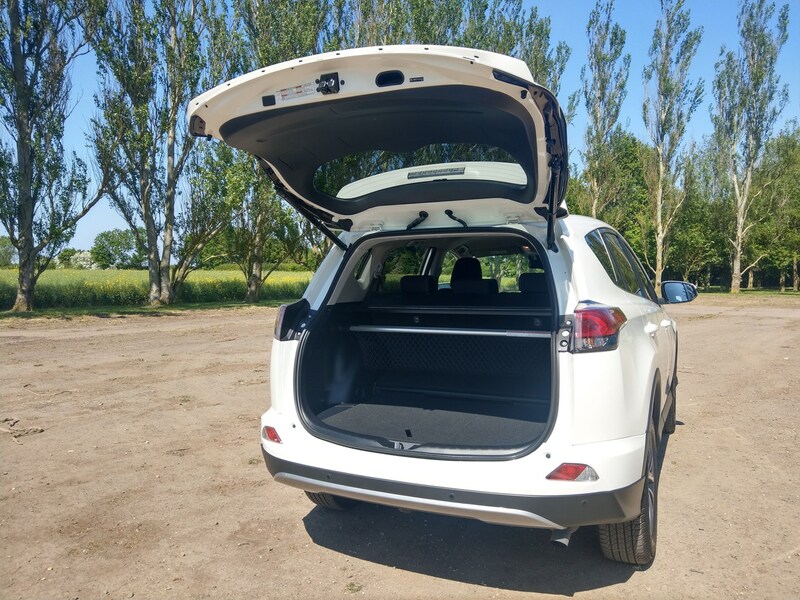 Furthermore, the 501-litre boot has a wider opening and a lower load height, plus the rear seats fold down to accommodate longer items. 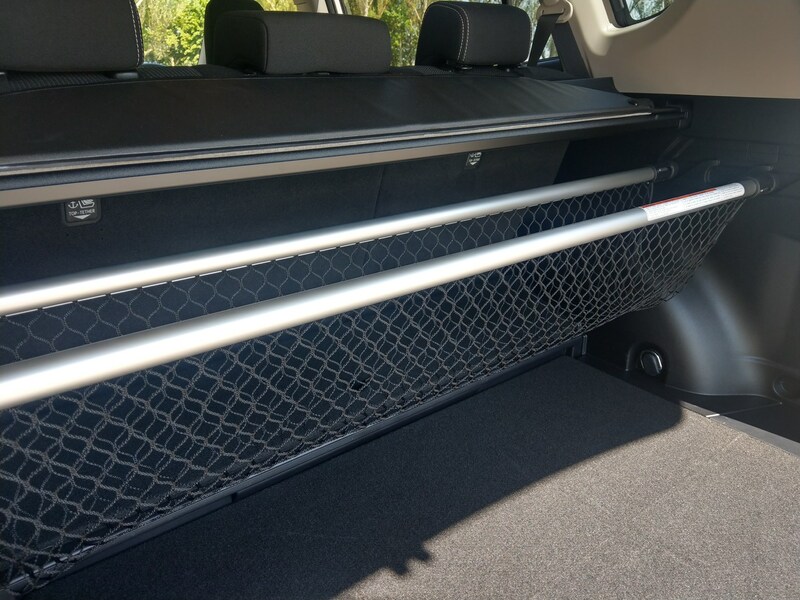 Another highlight is the luggage net suspended between the wheelarches, which would be ideal to carry shopping bags. In the C-HR the seats don’t fold and there’s only 377 litres of space back there. It doesn’t take long poking around the two cars to work out which makes the better family car. 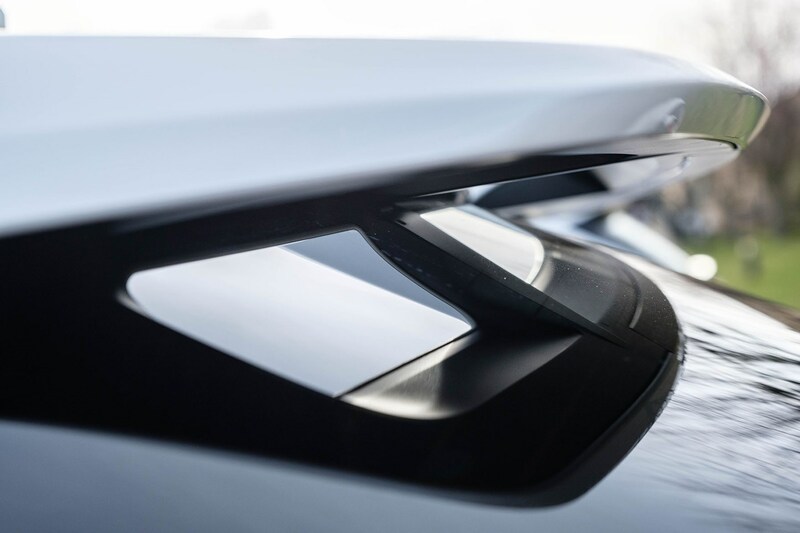 The final nail in the coffin for the C-HR is its bootlid, which you have to lift up yourself. The RAV4’s is powered and can be opened using the key. How do the specs stack up? The RAV4 is in Icon Tech specification, while the C-HR is in higher-spec Excel trim, but the kit on offer differs between the two cars anyway. In this case, the biggest difference is with the multimedia system. 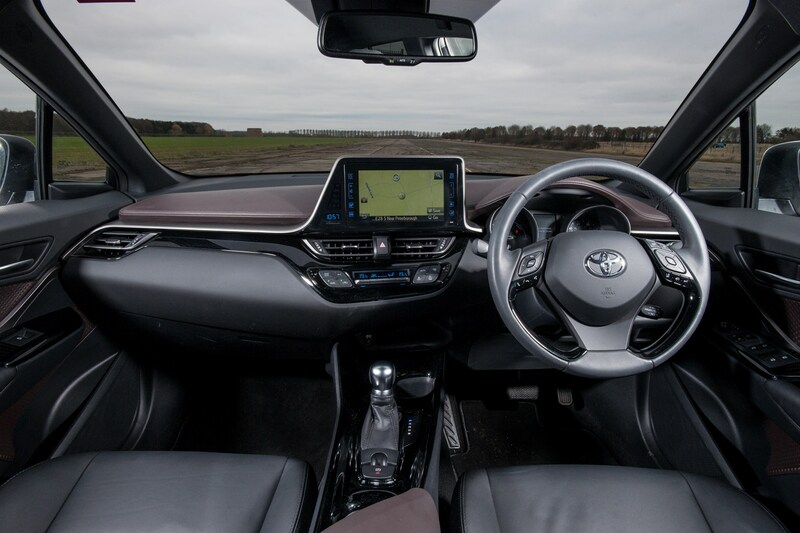 The C-HR’s has a newer and larger 8.0-inch touchscreen compared with the RAV4’s 7.0-inch item, and the latter also has physical controls for volume and radio band tuning – a solution we prefer to the C-HR’s slow and occasionally unreliable touchscreen-operated versions. 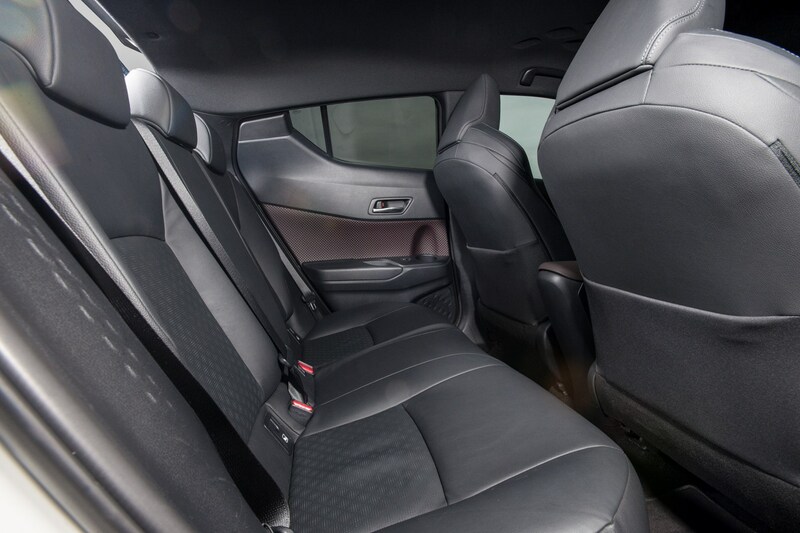 The C-HR does get part-leather upholstery thrown in, though our one has optional full leather at £995. The RAV4 has fabric seats. 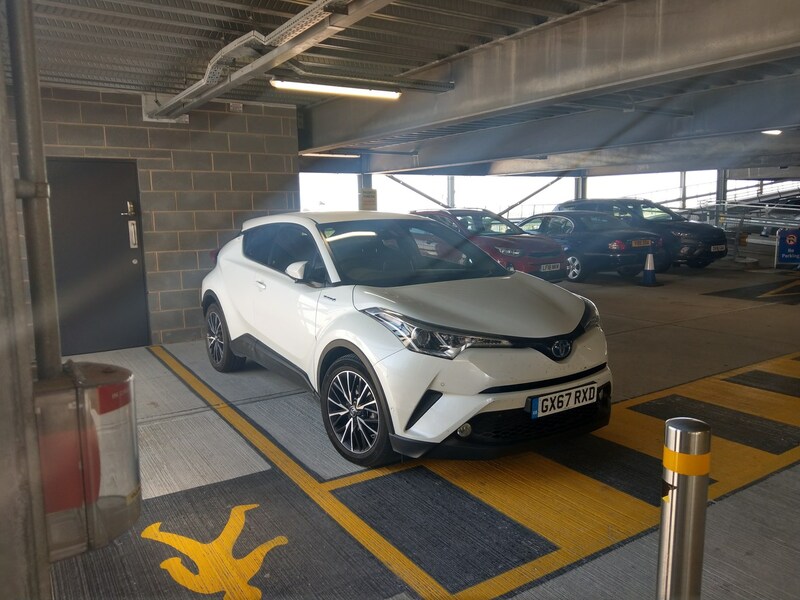 Both cars have optional special finish paintwork, with the C-HR’s pearlescent white costing £795 and the RAV4’s metallic white £545. They might look similar, but this article proves it pays to do your research because underneath we’re looking at a pair of quite different machines that’ll appeal to different types of buyers. Where the RAV4 is the larger, more practical machine that’s likely to appeal to more rational folk, the C-HR’s more fun and more interesting, so its draw will be for younger buyers who’re less interested in the practical aspects, or perhaps don’t have the kids to put in that overly gloomy rear seat just yet. While it’s been a technically fascinating exercise trying to squeeze every last mpg from the C-HR, day-to-day life doesn’t always like to play ball. Sometimes it’s just not viable to spend whole journeys at 50mph. Occasionally we all just want to get in and go, and a prime example of this is picking the car up from an airport car park after a work trip. You see, it’s at times like these a quick exit seems crucial. Invariably you’ve been flat-out for at least 24 hours, usually haven’t slept enough - in an unfamiliar bed - haven’t seen your family, and just want to make it home. I’ve been doing a lot of these runs over the past few weeks, at various times of day and varying levels of fatigue, and have been using the C-HR for the duration. It’s for that reason I feel pretty well-positioned to comment on this hybrid’s abilities as an airport accomplice. So is the Toyota C-HR the ideal car for the job? It’s a game of two halves, actually. One of the main advantages is the simplicity with which you operate the car. 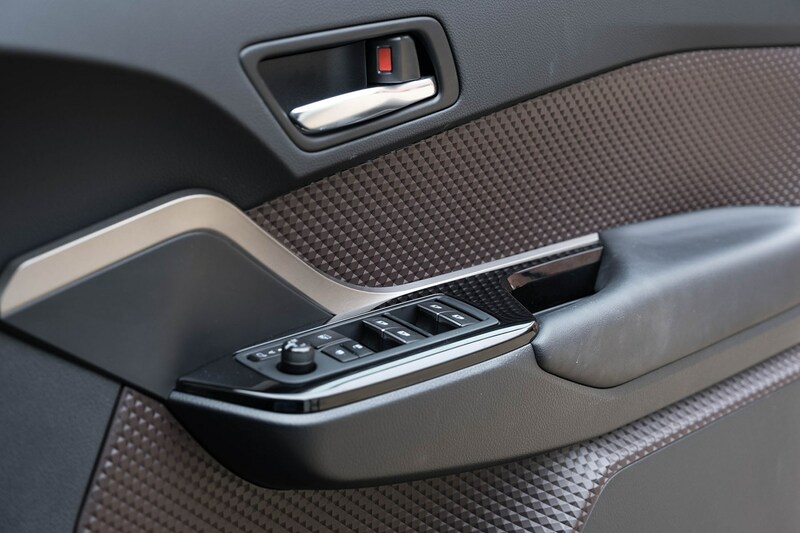 The idea that you can keep the key in your pocket or bag thanks to keyless entry and ignition, sit down, thumb the engine start button, pull the gearlever down to D and pull away from your parking space is a real positive if you’re in a hurry. It’s an easy car to drive. However, you’ll need to know where you’re going or use a smartphone-based navigation system for a truly rapid departure, because the Touch and Go 2 sat-nav takes a very long time to get going, and that can be doubly frustrating when time’s tight. You also have to accept a disclaimer (below) before being able to use it, but it takes around 30 seconds for the system to wake up before it's displayed. In fact, everything seems to take an age when you first switch the ignition on. If you've been listening to music streamed through Bluetooth, this'll take 20-or-so seconds to kick back in. On some occasions it doesn't work at all, though - I often have to head back to the Source screen and reselect Bluetooth. Music streaming also cuts out when I'm driving every now and then, and I've so far failed to figure out why. It means more screen prods, though, and can get very boring on a longer drive. You see, the 8.0-inch touchscreen on our C-HR is very unresponsive, so entering a nav destination is a drawn-out process too. Sure, I could in theory use voice control (button shown above) for this. It’s almost ubiquitous in new cars nowadays, but given its seeming inaccuracy even when trying to call a contact in my phonebook, it’s more trouble than it’s worth. And while on the subject of the sat-nav, I’ve been doing a bit of comparison with Waze – the peer-to-peer live traffic navigation app on my smartphone – and that’s significantly ‘smarter’ than the C-HR for predicting ETAs. Take this morning, on my way to Heathrow. The Toyota said I’d arrive at 11:10am. Waze said 11:28, and I rolled into the car park at 11:30. The hold-up was on the M25 (surprise surprise) but Waze had somehow predicted and accounted for it. The C-HR isn’t that clever. What I’d really like – and something I sampled just a few weeks ago in a Subaru – is Android Auto to mirror my Waze onto the touchscreen. That would be almost the best of both worlds, though presumably I’d still have that pesky disclaimer to wait for. Still, on a late-night run I’m usually fairly happy I’ve got the Toyota in the car park. There’s no problem storing luggage for a trip of a week in duration, and I know I’ve got a comfortable and quiet drive ahead of me. Should I want to head off the main routes back, which is something I do regularly to break the M25/M1 monotony, the lively steering and balanced handling do enough to make this small SUV genuinely entertaining. It’s difficult to argue with the 50mpg+ I’m now getting every time I calculate fuel economy figures, too, and the adaptive cruise control makes easy work of those annoyingly frequent 50mph zones with their nanny-state SPECS average speed cameras. So my wishlist for the C-HR as an airport car? Pretty simple really: a quicker, more powerful multimedia system with more modern functionality. 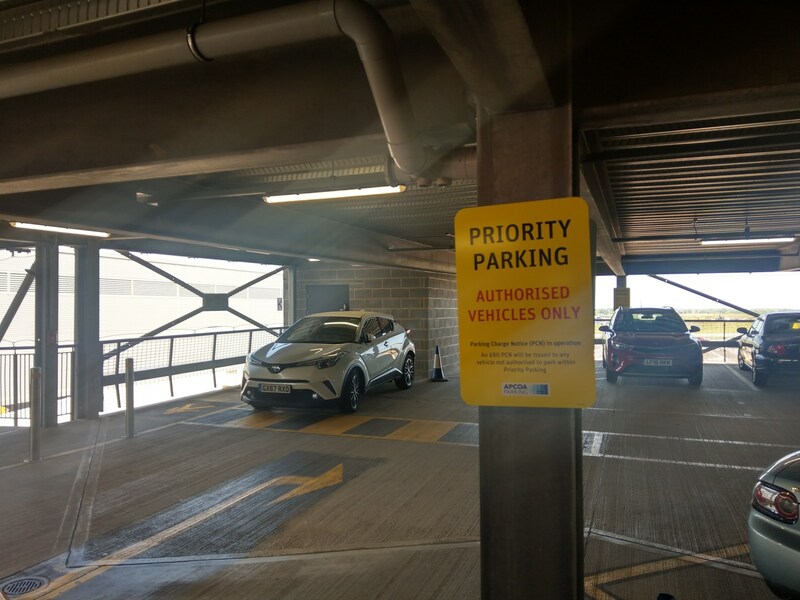 After completing the eco run in our C-HR, it was clear that under some circumstances there were some huge economy improvements to be gained by a bit of careful planning. So armed with our findings we sat down with a regular user of the car – mother of two Leise Enright – to see if our tips could save her some cash on her commute and the school runs. From the outset Leise was managing 43mpg from the C-HR. That’s not the worst we’ve ever heard of, but given our man managed 80mpg on the eco drive, there’s definitely headroom to play with. 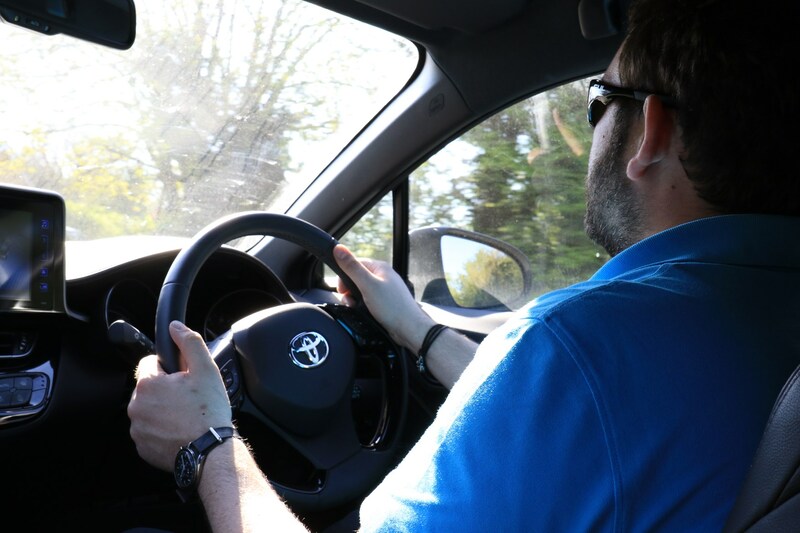 To carry out the tutorial we headed to a local airfield’s spare runway – keeping out of the way of the general public – and explained a bit about the methods we used to get the mpg up. The main gist of the advice was to maintain momentum by planning as far ahead as possible, trying not to use the brakes too much and anticipating what would happen next. Another facet of it is to make best use of the engine – or more precisely, the electrical assistance from the batteries. Since the C-HR is a mild hybrid (Toyota calls this self-charging), you top up the batteries using brake energy recuperation when coasting and slowing down rather than with a plug. 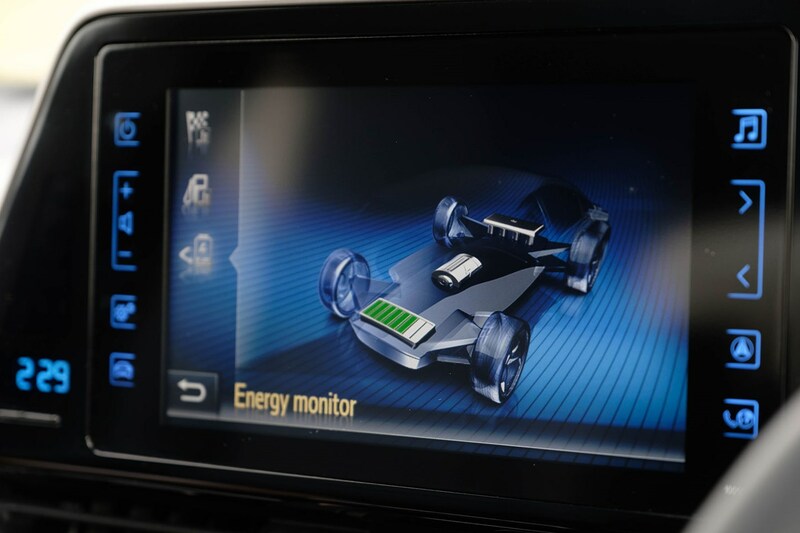 That means when accelerating again, there’s usually enough electrical energy to at least get moving without using the conventional 1.8-litre petrol engine. Since you’re using no fuel to get the car going, this is a great way to save fuel, but it does mean being gentler on the accelerator pedal – not ideal when you’re in a rush. 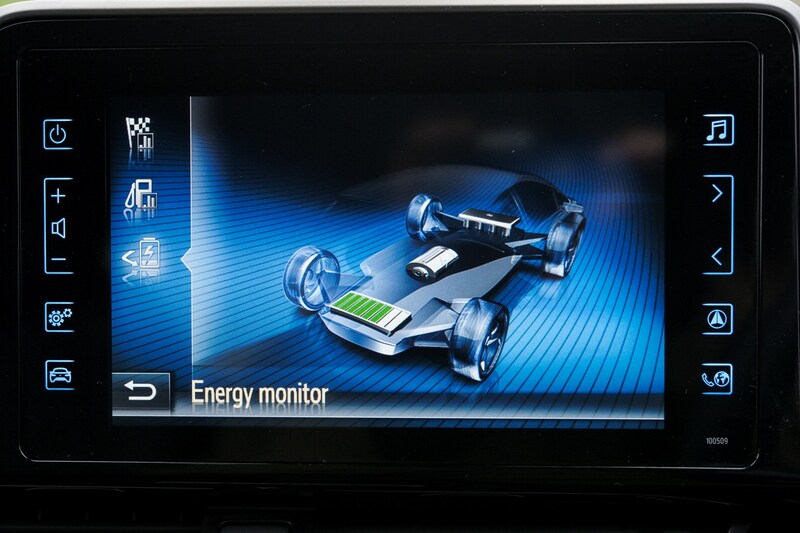 You can see all these in action using the large touchscreen in the car, as below. 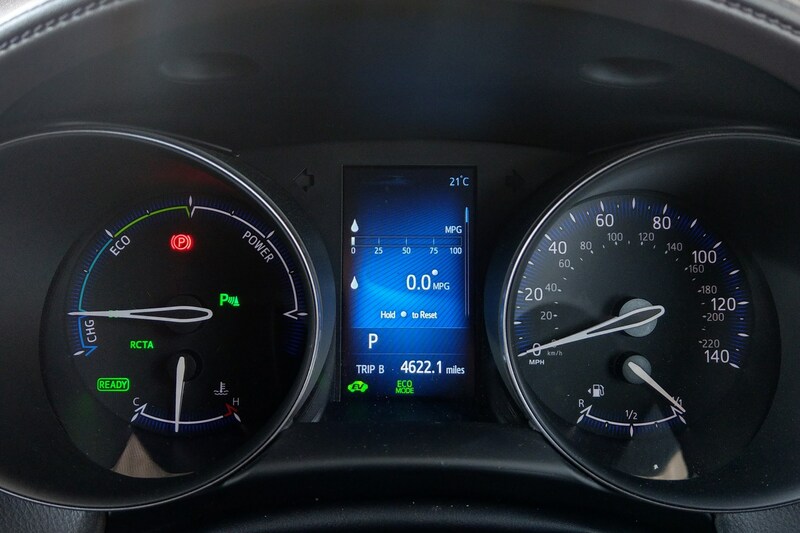 Then, it was about explaining some of the controls and what effect they can have on fuel economy. Once we’d finished the tutorial, it was back out on the open road again for Leise, with the trip computer reset to see the difference. She immediately noticed an improvement. ‘It was sort of what I thought I needed to do, it is just a case of having to remember to do that and not just putting your foot down,’ she said. A few days later she reported 51mpg after resetting the trip computer. That’s an 8mpg improvement, but that doesn’t mean very much to most people. However, if we crunch some numbers we see that you’ll be able to travel 85 miles further per tank in the C-HR, which means you’ll be getting valuable extra range, and based on the C-HR’s 43-litre fuel tank, it works out you’d save £2 per fill-up. Now, £2 might not change your financial situation immediately, but given some more practice and confidence in the car’s performance, it’s easily possible yet better economy could be forthcoming. Don’t forget, if you’re filling up once a week, that’s still at worst a £100 saving in a year. And that’s worth having. ‘If I wasn’t in a rush and just on a normal commute, it was saving fuel. I suppose if I were driving it all the time I would save money. You’ve just got to concentrate!’ concludes Leise. Update 11: How does it fare on finance? 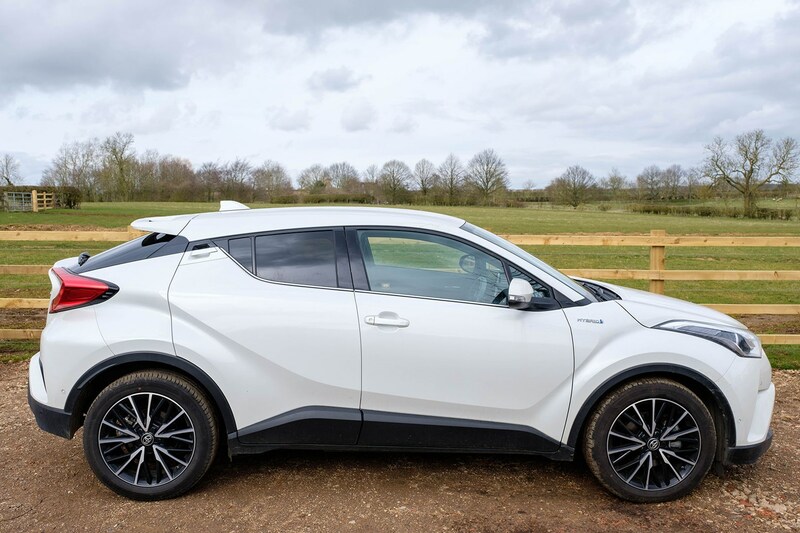 Our C-HR is a very clever car, and one that was ahead of its time when launched back in 2016 thanks to the combination of hybrid tech, driver appeal, an SUV bodystyle, space-age looks and quirky cabin customisation. Save money: pick a... VW? But that little lot does come at quite a price if you’re looking to fund your car through PCP finance, which is how the overwhelming majority of the UK motoring public acquire their new vehicles nowadays. 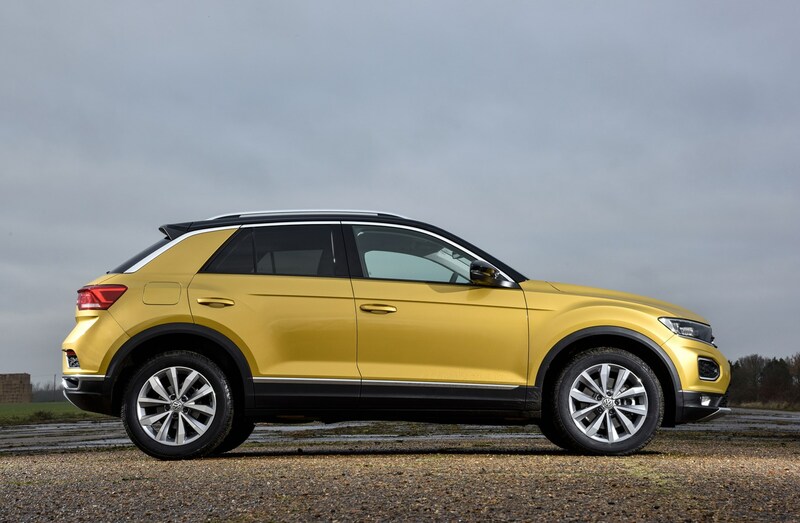 Take the VW T-Roc (above) for example: this direct rival, in an equivalent trim level but with a much more powerful engine will cost £34 per month less than the Toyota. That’s over three years, so you’ll save £1,200 by picking the VW. There isn’t really much left to say. The C-HR is more expensive outright as well as being significantly costlier to finance, and you don’t even get metallic paint thrown in as you do with the Mazda. So, you'd save nearly £3,100 by picking the CX-3 and handing it back at the end of the contract compared with the Toyota. 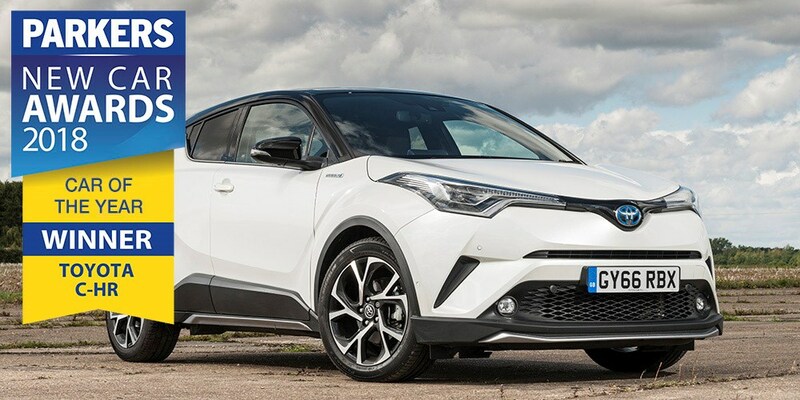 And if you wanted to buy the car at the end of the contract, you'd have spent over £6,200 more overall with the C-HR than the CX-3 and have to find an extra £3,142 for the optional final payment needed to take ownership of the Toyota. This isn’t an issue unique to the C-HR, though. Toyota’s PCP finance is often more expensive than rivals’. Price up a RAV4 (above) – the firm’s larger SUV - and you’ll find that’s fairly costly relative to the competition too. The time has come to wave goodbye to our 2017 Parkers Car of the Year, the Toyota C-HR. Over the past year we’ve been living with one to find out what life’s really like living with the hybrid SUV, and the findings have in the main been positive. We found the ability to return impressive fuel economy when pushed – up to 80mpg when trying really hard – was almost as remarkable as just how fun to drive the C-HR can be on your favourite road. A car like this doesn’t need to be so entertaining, but its direct steering and nimble chassis really do entertain. It’s no hot hatch, but the ride and cabin refinement are far better than performance-focused vehicles too, so for an everyday proposition it’s a better solution. However, there are drawbacks – particularly in the practicality stakes. The boot’s not massive and has a relatively high loading lip, but it’s the rear seats that proved most problematic. It’s very dark back there thanks to tiny rear windows and the handles are so high up on the doors that they’re difficult to reach with an armful of shopping. We also managed to find fault with Toyota’s finance offering, which is outclassed by many other companies offering competing products. This makes the C-HR a difficult car to recommend from a purely pragmatic perspective. And the multimedia system leaves a little to be desired in both functionality and performance. But as a parry to that, the C-HR does represent a decent proposition for tax – particularly where a company car driver is concerned – thanks to the low 87g/km CO2 output. And as an ownership proposition of course we can’t ignore Toyota’s reputation for building robust, reliable cars. We pit the C-HR against a number of its rivals over our time with it, taking aim at VW’s T-Roc as well as the in-house RAV4 and in a number of multi-car group tests, which gave us a good insight into the Toyota’s positioning in the contemporary car market. In every comparison the C-HR fared well, and that’s apart from the subjective appeal of its futuristic, angular styling inside and out. The design marries perfectly with the hybrid drivetrain to make the C-HR feel very of now – it’s a car that feels highly relevant given the recent steer away from diesel and towards electrification, and is priced in a way that makes it accessible for the average new car buyer. We also drew comparison with the quirky Sera - another distinctive Toyota of yore. Sure, it’s not for every driver out there, but both fleet and private users abound will find the C-HR a dependable, likeable, forward-facing and functional machine that offers more than your average small SUV. 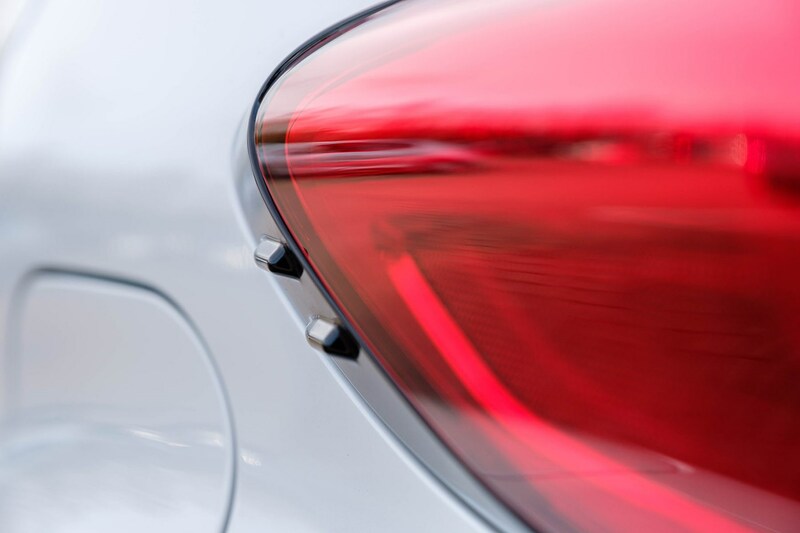 Now, time to find out what 2019's Car of the Year will be… keep an eye on Parkers to see it announced in September.